Kinesis International have been producing forks and carbon stays for some of the world's largest bicycle manufacturers since 1989, and they are still at the cutting edge of carbon and alloy fork technology. 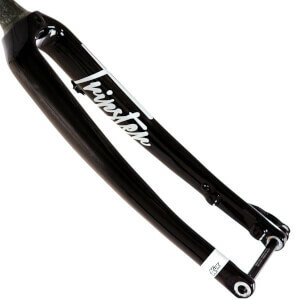 Full alloy fork with tapered and butted 7075 blades. It has a sculpted crown with clearance for a full size 'guard, and the blades have been re-profiled to give a smoother ride. Full alloy fork made from 7075 alloy. Clearance for full size 'guard, with eyeleted dropouts for easy fitment. Suitable for long drop (47-57mm) brakes. New graphics make this a sharp fork on any bike. Ideal as a winter training fork. 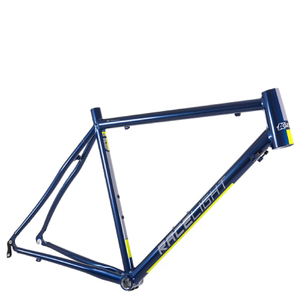 I purchased a Kinesis Racelite T2 with standard short drop caliper carbon front forks. As I wanted to use fenders and 28c tyres a long drop caliper fork was needed, Once I swapped to the alloy fork I did notice a difference in comfort, however, it was not a great difference and for a bike I mostly use for commuting when it's raining it's no problem for me. On smooth roads these are great and they also match the Racelite T2 frame. I'd searched hard for a quality all aluminum fork to strip and powder coat paint to go on the bike I was building up for my son's college graduation present when I located the Kinesis Road Training fork. I knew it was a quality fork just by reputation. It needed to be strong.for gravel roads of the American Southwest deserts. I didn't even need to repaint it. The frame was white with black lettering and the gloss black fork enhanced the esthetics of the bike. And the fork performed perfectly. I hated giving it away. It was great value and I'd definitely recommend it.